Offshore sailing serves as an ideal platform for team building, small unit leadership, and seamanship skill development. All planning and decision making involved with day sailing and long distance transits and racing is made by midshipmen team members. Skills developed include navigation, strategic planning, resource management, vessel maintenance, weather tactics, and racing strategy. The co-ed Varsity Offshore Sailing Team (VOST) practices and competes during the fall, spring, and summer aboard Navy 26's, Navy 44 Sloops and a variety of donated offshore sailboats. Competitions involve both intercollegiate and civilian teams. During the summer, VOST focuses on long distance Halifax, Nova Scotia. Traditionally, midshipmen also race to Bermuda each summer as part of the Professional Development Training Program. Additionally, VOST members represent the Naval Academy at National and/or World level regattas both domestic and internationally. The Naval Academy has the largest offshore sail training fleet for collegiate sailing in the United States and hosts many of intercollegiate sailing's big boat regattas. JVOST is mainly comprised of midshipmen who are first semester sailing team members and have been selected for the team during tryouts each August. JV team members spend their first months training on Navy 26's with a four person crew. Teams learn the mechanics of sailing, safety at sea, small boat handling, and racing fundamentals. JVOST competes in weekly scrimmages with up to twenty Navy 26's racing on short courses in close quarters. 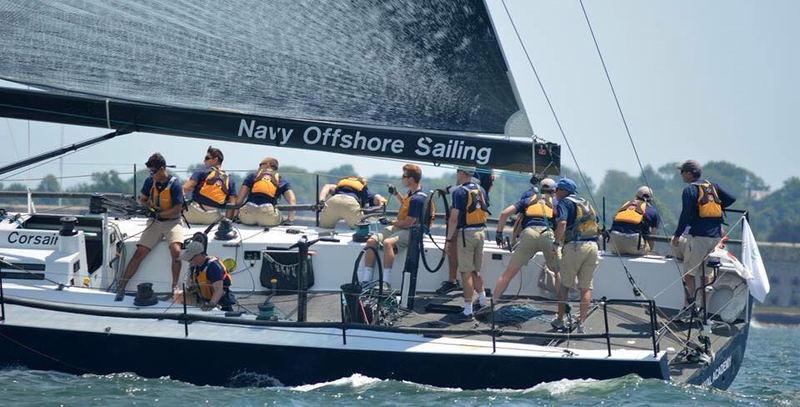 As well, the US Naval Academy hosts an intercollegiate event each fall which attracts teams from the mid-Atlantic, New England, New York, and Midwest regions. Toward the latter part of the fall semester, JV team members are cross trained on Navy 44's to learn the mechanics of sailing larger offshore boats. This provides the pathway for the spring semester when the Varsity and JV team members train and sail together in preparation for their summer cruise experience on large offshore sailboats. The NASS Race Committee is an organization formed to support Naval Academy Sailing in matters of competitive sailing and volunteer administration for the benefit of midshipmen. The NASS Race Committee recruits, trains and equips to support sailing competitive officiating, safety and procedure through the use of non-paid volunteers. If you are interested in serving as a volunteer on the NASS Race Committee contact the NASS Race Committee Chairman Tom Stalder at captntoms@gmail.com.